“Blogging is bad for your back.” in Saudi Arabia. 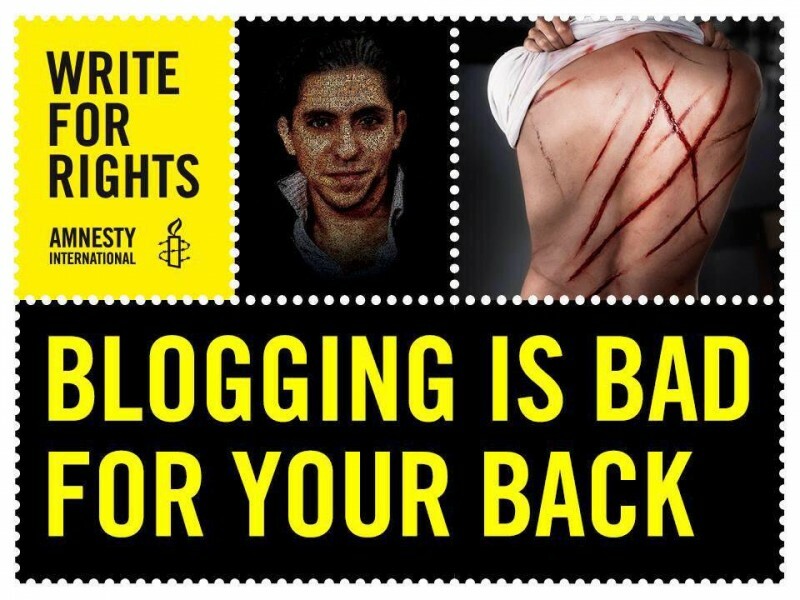 Image used as part of an Amnesty International campaign to draw attention to the plight of Saudi blogger Raif Badawi, sentenced to 10 years in prison and 1,000 lashes in Saudi Arabia in 2014 for setting up a “liberal” website. Saudi Arabia has sentenced a Twitter user to 10 years in prison in addition to 2,000 lashes for publishing 600 tweets “which spread atheism” on the micro-blogging site. According to Saudi daily Al Watan the Twitter user, whose name was not disclosed, was sentenced by a court in Medina which found him guilty of denying the existence of God and holy scriptures, accusing prophets of lying and also ridiculing the Holy Quran. He was also fined 20,000 Riyals (5,300 US dollars). The man was arrested after the Information Crimes Prevention Unit at the Committee for the Promotion of Virtue and Prevention of Vice or Saudi Arabia's religious police started monitoring his Twitter account. The newspaper adds that the man, aged 28, confessed his atheist beliefs in court and refused all attempts to make him repent, citing his right to freedom of speech. He added that he was previously a Muslim, and has now renounced all religions after communicating with websites which spread atheism on the Internet. The court, added the newspaper, proved the accusations against the man based on his confessions and the testimony of four men who said they found the Twitter account on the man's mobile phone, and it was proved that the service operating the phone was under his name. The sentence was met by a muted response online, with many just exchanging links to news stories without much commentary on it. علي مستخدمي مواقع التواصل في السعودية توخي الحذر.. This is Saudi Arabia. A 28-year-old Saudi man has been sentenced to 10 years in prison, 2,000 lashes and a 20,000 Riyal fine for atheism on Twitter. Users of social media in Saudi Arabia should be careful. You are being watched, persecuted and threatened. A simple tweet could threaten your life. What a society of ignorance and backwardness! In May 2014, a criminal court in Jeddah sentenced blogger Raif Badawi to 10 years in prison and 1,000 lashes for “insulting Islam”. Badawi was prosecuted for developing “Saudi Arabian Liberals”, an online forum he launched in 2008 debating the role of religion in the country. The then 32-year-old was also ordered to pay a one million riyals fine (approximately US$266,600). Despite an international campaign calling for his release, Badawi is still in prison today. In January 2015, he was flogged 50 out of the scheduled 1,000 lashes. His second flogging has been postponed due to Badawi's poor health.